AVG provides one of the most popular free antivirus, AVG Free Antivirus. The latest version of AVG Antivirus 2014 can be downloaded from the AVG site or we also have offline installers for all AVG products. 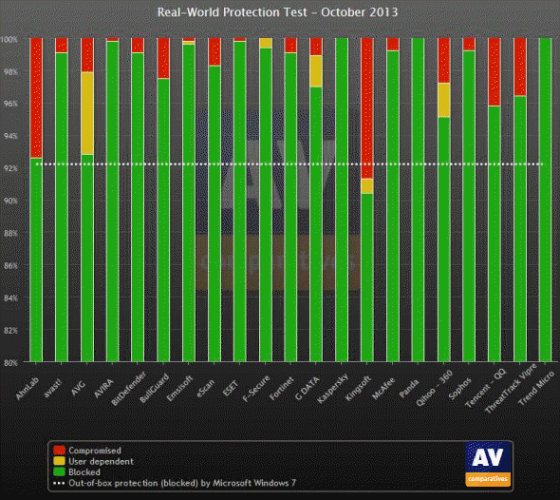 According to October 2013 real world protection tests, AVG security products were able to protect the systems from 98% of the malware. 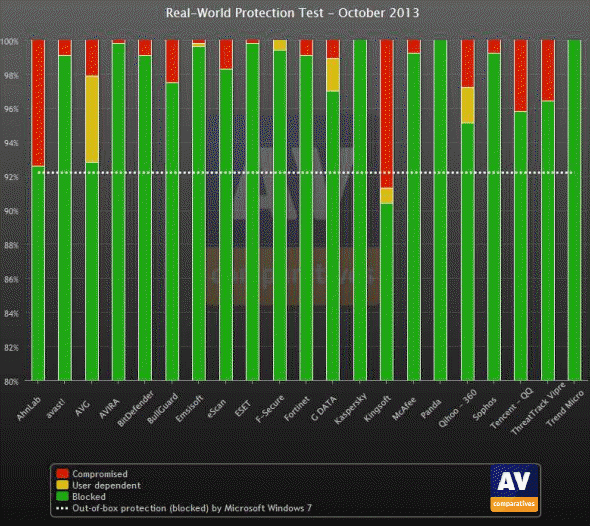 These results are not good for AVG as the other competitors like Avira and Avast scored 99+ %. Apart from these tests, my experience with AVG has been good. I have yet to experience a problem with AVG Internet Security 2014 on my production PC. Windows performance with AVG Internet Security installed has been exceptional and I have not seen any lag in performance of the system. The firewall also works reasonably well and more importantly mostly works in silent mode not bugging me every now and then. I have already shared on iTechtics about how to get a one year free license of AVG Internet Security 2014. 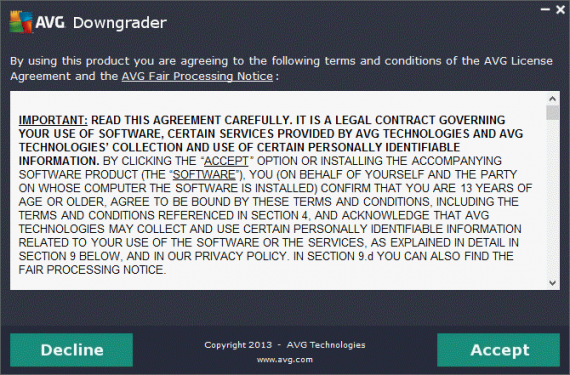 If you have already installed a trial version of AVG product, you won’t be able to use this offer and will have to uninstall the trial until you purchase a license. The other way round is to uninstall the trial version and install AVG Free Antivirus. The trial versions are meant to provide a testing ground to the user. If the user is not satisfied with the product, then the product should be uninstalled because it will stop working after the trial period. But here’s a scenario that you want to try out AVG Internet Security 2014 or AVG Antivirus 2014 instead of the free version. You will get a 30 day trial version of the product which you can run for a month and then decide whether to buy it or uninstall it. 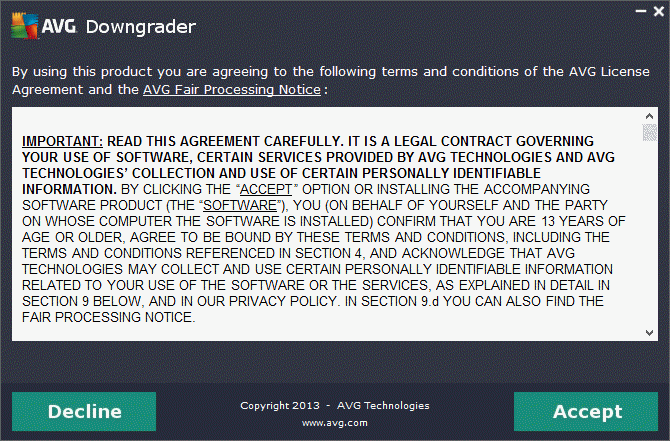 The user may decide that the paid versions of AVG are providing the same set of required security that the free version is already providing. So the user may not be tempted to buy the paid versions and will want to revert back to the free version. The straight forward method of doing this is to uninstall the already existing AVG product and then install AVG Free Antivirus. AVG Downgrader is a tool provided by AVG that will turn any trial version of AVG Internet Security or Antivirus into AVG Free Antivirus. AVG Downgrader is a one click utility which will automatically and instantly get its work done. 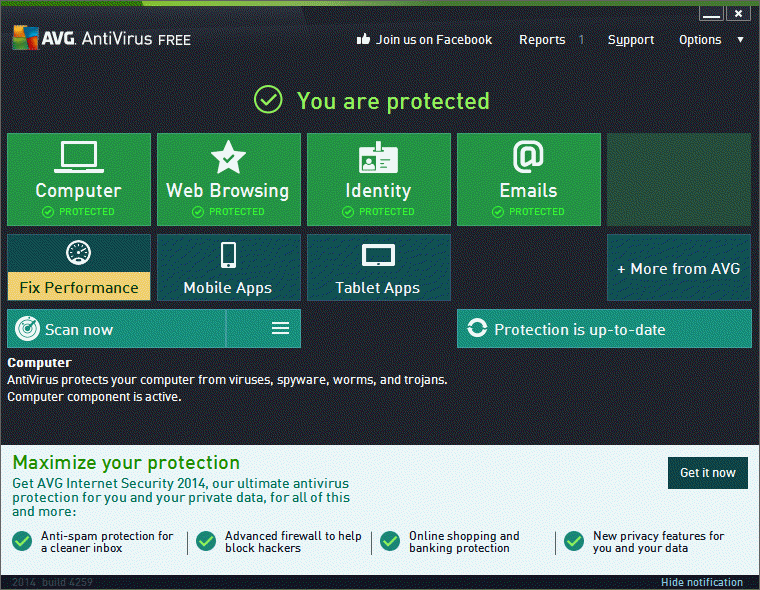 Just follow the steps below to turn your AVG product trial into free antivirus. Click on Continue button. This should proceed to automatic conversion of trial software into AVG Free Antivirus. You may need to restart your computer after converting the trial. When I ran the AVG Downgrader on my computer, it didn’t ask for a restart because I had terminated its process from Task Manager. But after updating the AVG Antivirus definitions, I was asked to restart the computer. While the AVG Downgrader may take less time to convert the trial installation into a free one, it may leave some of the files and folders in your hard drive which can be manually removed. Uninstalling the trial version first and then installing AVG Free Antivirus will get rid of this problem but will require more time and you may even need to download the free antivirus first. 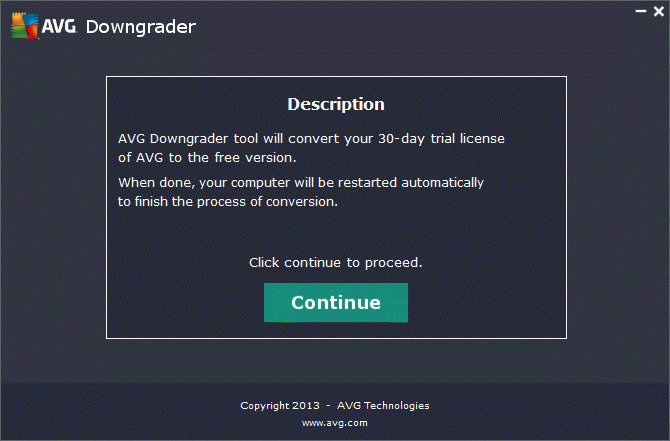 I’ve just read your article regarding transferring from paid trial version to free version of AVG. Just wanted to say I Followed your directions, and they worked perfectly! Thank You! I hope you have a wonderful day and a very blessed life. This is quite astonishing that it happened to you. I think you will need to contact AVG support for the resolution of your problem as your account would have been charged by AVG.